Thanksgiving is an ideal time to help preschoolers learn about gratitude. Though young children may not be able to express gratitude in the same way as adults, teaching them how to be thankful will offer them many long-term benefits. 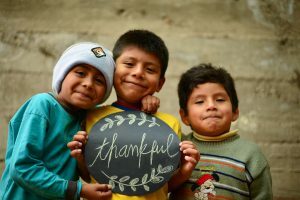 Research has shown that thankful children and teenagers are more optimistic, more satisfied with their surroundings, give more emotional support to others – and even have higher grades. Gratitude and thankfulness are ACTIVE terms that require kids to participate in some manner. Young children that have adults around them that model good manners, common courtesy, the ability to wait for the things we want, and demonstrate kindnesses, grow to be children who have a good foundation upon which to build. Can preschoolers really learn gratitude? Try these ways to help teach your preschooler about gratitude. Model gratitude in your daily life. Whether it’s hearing you say a simple thank you or discussing the good things that happened during your day, small examples of everyday thankfulness will make an impression on your toddler. Work gratitude into your daily conversation. When you reinforce an idea frequently, it’s more likely to stick. One way to turn up the gratitude in your house is to pick a “thanking” part of the day. Two old-fashioned, tried-and-true ideas: Make saying what good things happened today part of the dinnertime conversation or make bedtime prayers part of your nightly routine. Encourage generous acts. Preschoolers love to feel helpful, and Thanksgiving offers many chances to encourage this behavior. For example, you can suggest they help other boys and girls by donating a toy or some of their old clothing. When having this discussion, avoid the tendency to motivate by guilt. Instead, explain to them that some children don’t have toys, food, or clothes. Your preschooler may surprise you with how much they are willing to give. Ask for help around the house. Whether it’s putting away their toys or helping you to mix ingredients in the kitchen, age-appropriate chores can help preschoolers develop a sense of thankfulness. By participating in simple household chores like feeding the dog or stacking dirty dishes on the counter, kids realize that all these things take effort. Teach your child to say thank you—and to mean it. When your child receives a gift or act of kindness, talk with her about how it makes her feel. Connect the gift or action to the feeling of happiness or joy she feels when receiving it. Then, have her express this feeling to the giver with a “thank you.” You can have her draw a picture to thank the person. Or, help her write a short thank you note. You can also have her dictate the note to you. Teach them that things aren’t most important in life. With all the product advertising aimed directly at children, it can be hard for your preschooler to understand that objects are not the most important parts of life. You can help to counteract this by talking about less tangible things you’re thankful for, such as family mealtimes, having enough food to eat, or spending time with a friend. Point out the simple pleasures in life. The ability to enjoy each moment leads to a grateful heart. Teach your child appreciation for life’s simple pleasures, such as a gentle rain, a star-filled night sky, a multitude of fireflies at dusk, and a glorious sunset. Point out these wonders and marvel at them in front of your child. Say no from time to time. If a preschooler is always able to do what they want, or gets any toy or snack they ask for, they begin to learn that life is about endless rewards. Thankfulness is all about understanding that life’s rewards are not something to take for granted. Connect the act of giving with the meaning behind it. Whether your child receives a physical gift or a practical gift, it’s important to help her understand the kind thought behind it. For example, you can say, “Wasn’t it nice for Grandma to knit you those mittens? She wants you to be warm in the winter.” This will help your preschooler see that gifts are given for thoughtful reasons. Read books that re-enforce the importance of gratitude. Read your child books that feature characters expressing gratitude. Read him books that lead to discussions about gratitude. Bear Says Thanks, Sylvester and the Magic Pebble, and Dr. Seuss’s Did I Ever Tell You How Lucky You Are? are a few of the classic books that drive home the message or gratitude in a way your child can appreciate. Keep in mind that teaching gratitude to children takes time, patience, and—yes—a grateful heart in YOU. It’s an ongoing process and it certainly won’t happen overnight. You’ll need to continue modeling and practicing thankfulness and appreciation throughout your child’s development. It takes lots of love and reinforcement along the way. These life lessons will give your child a strong foundation in empathy and a grateful heart.